Photography is usually a source for painting inspiration for me. Over the years, I have taken quite a few, some of which I feel stand on their own. Here's a selection. Check out my Instagram account for more. Observing this family at a Quebec beach, I captured a moment of pure summer. The girl enjoying being in the air. The father sharing time with his children and the son upset that his sister is having the fun when it should be his turn. I kept coming back to this photo whenever I was looking through my collection. It just held my attention. It was a clear January day with the sun setting and streetlights already on and it was an impulse shot. Walking home from work one afternoon, I was struck by seeing this hot dog vendor relaxing by his stand. Being present but cut off from me at the same time stuck me in my tracks. I had never seen something like this before and for once, I felt really compelled to take a picture of something that was not foggy or blurry. Nevertheless, there is the ambiguity of not seeing half the subject and having to fill in the story for ourselves. This was the fan favourite when I posted it on Facebook, so here it is again. As is obvious from this page, I love atmospheric conditions that skew a clear view of anything. This one suggests movement into the distance in a subtle way. It was an amazing day, so completely foggy with the trees receding from the road simply dissolving into the distance. I was in Caledon in the fall and stepping outside one morning, the sun lit up a maple tree into a glorious yellow. Coming close, I saw a spider web covered in morning dew. With my limited photo abilities, I took some shots and while they all turned out, this one was the most lyrical for me. It is not an easy photo, you have to look to find the story of the spider. Later that afternoon, I went by the tree again, and it was just a dull fall tree, the fall glory had passed. This is my favourite, I think because of the balance. The walkers are so well spaced and counterintuitively, hidden by the bright lights at night. I also love the snow in the foreground that is so sculpted and present. They all seem to be fighting the elements, that's the story that keeps coming back to my mind. A happy accident occurred here. A walker in a hoodie with a leg appearing like a ghost's. The stone pillar at the left like a tombstone. The harsh lights of a car just off to the right. It all adds up to the beautiful extremes of bright and darkness of night time in a city. Unlike most of my other snowy night photos, this one actually has people who are connected to each other. They are simultaneously at ease with each other and vulnerable as they cross the snowy street against the traffic. I find it both calm and tense. I took this photo on my most inspired image day ever. I have made three paintings from photos I shot that day. I thought about painting this one, but for the moment prefer it as a photos with beautiful gentle gray gradients. It is a moment of calm and quiet in a part of town that has always appears frenetic to me. Continuing with some gray, here's my lunch hour outing during the first real snowstorm in Toronto in two years. It's always what's unfocused and in the distance that interests me. I am fascinated by all colours fading together into simple grays and blacks. 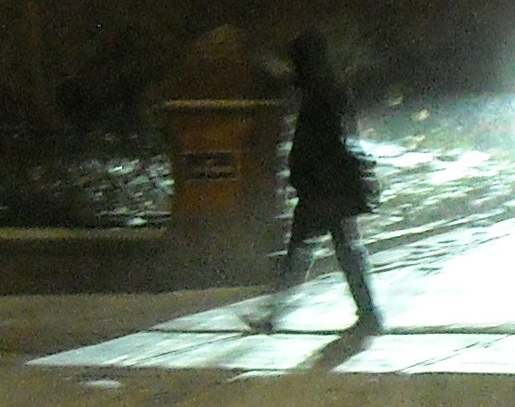 The image of the woman struggling through the snow to cross the street drew my attention. You can feel her feet sinking and fighting against the snow, the stress of crossing the street before the light changes. Combining that with the uphill slant of the street added the final element to the story. First time at Canada's Wonderland Halloween Haunt in 2012. Perfect night - warm and no wind. At one point they were spewing gas (steam I guess) and had coloured lights shining into it. I took a few photos, but really should have taken more. The isolation and gesture of this couple caught my attention. Framed by the red, we can just make them out, but can still tell ourselves a story about them. Wonderland once again. Here's a happy accident. I pointed and shot and captured a ride in free fall. You can tell it is a ride, but it is abstract enough to make it interesting. Maybe some day I can do this again!